The instructions on the sides of our kits are simplified reminders of the procedure for advanced users. These are the extended instructions for the Salt Level Test Kit, that give you all the needed details on how to test your pool for salt levels. Using the measuring cylinder, obtain a sample of pool water (~210mL). Make sure the sample is from at least elbow deep in the water. Place the measuring cylinder on a level and stable surface. Place the salt hydrometer into the measuring cylinder. Tap and rotate the hydrometer to dislodge any tiny air bubbles. Be careful not to break the thin stem while handling the hydrometer. Note: Air bubbles that settle on the hydrometer will cause an artificially high reading of your salt levels. The water level on the salt hydrometer stem will indicate the salt level in parts per million (ppm). Note: The hydrometer is has been calibrated using water that is 25oC. If the water temperature is cooler or hotter than this, the reading will need to be adjusted according to the table to the right. Rinse the hydrometer with tap water, and then store in a cool, dry, place. Do NOT leave this hydrometer on its side. Store upright to maintain the shape of the stem. This entry was posted in Instructions and tagged salt, testing, the basics. 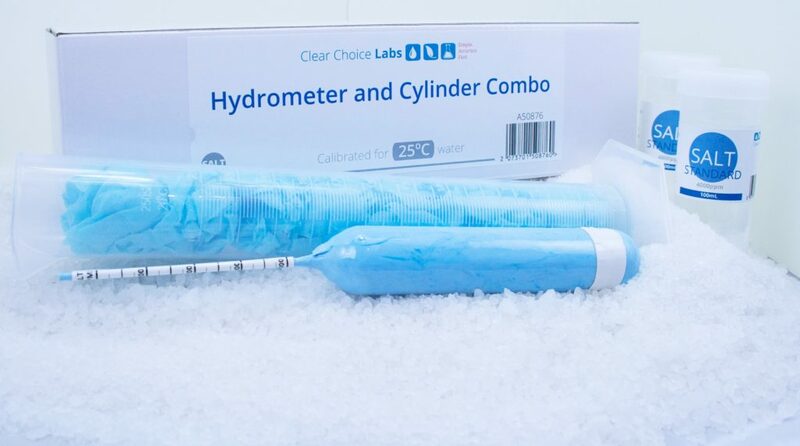 I tried to get a narrow range hydrometer over a year ago but failed, I can’t wait to get my hands on one. Salt is one parameter that the pool shops around me record quite poorly, even with their expensive conductance meters, often up to 1000ppm out, which can be as much as two bags of salt and potentially damage a chlorinator. Thank you so much Clear Choice Labs, your customer service is second to none and my pool has never looked better.